Breakfast in the most important meal of the day. So important in fact that my children tend to eat 2 breakfasts each day. Why you ask? Well, it all started this year when their school time changed. My son no longer took the school bus and my daughter started Kindergarten. Which meant that I had 2 children to get to school and they could sleep in just a bit. 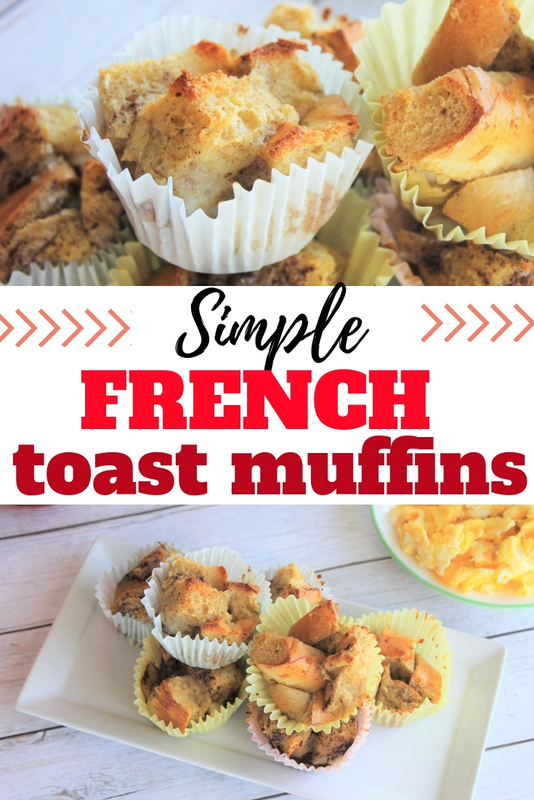 I thought I could easily come up with some simple recipes like these french toast muffins for a quick daily breakfast. What I didn't realize, is that my son has the breakfast appetite of a horse and could eat me out of house and home. My brilliant idea to make quick breakfasts turned into me having to make eggs almost every morning and the kids barely getting there on time. And to top it off, they'd both show up at school and eat breakfast at school as well. Which meant that before 9am they both have eaten 2 full meals. Something had to give. Our daily breakfast at home turned into a quick on the go breakfast. That's where these french toast muffins came in. Now I could make these muffins once a week and they could grab one before they headed out the door. Than once they got to school they could each breakfast there. So far, it has worked fairly well. We have a small breakfast at home like the muffins on the weekdays and on weekends we have a big breakfast like having stuffed french toast and scrambled eggs. This seems to work out much better for everyone. They get a little breakfast snack at home and than can sit with their friends and enjoy breakfast at school as well. Perhaps you are curious as to why french toast muffins. Well, I often have leftover breads from french bread, rolls or sourdough bread. It's still good but everyone is starting to get tired of eating it. So cutting it into small pieces and making french toast gives it a new twist and a yummy new meal. For this recipe you just need a bit of bread, a few eggs (I love that I can get them from our chickens) and sugar, vanilla and cinnamon. That's it!! You can add syrup at the end or you can keep it off. Totally optional but does add more flavor. One tip, is to make sure you use muffin liners. With the egg in the mixture it makes it really difficult to clean your muffin pan after baking these french toast muffins. I'd also suggest using foil muffin liners. The mixture is pretty wet and the foil liners work better. If you don't want to use liners, use a silicone muffin pan so they pop out easier. Hope your family enjoys these yummy french toast muffins as much as we do. Cut bread into 1" bite sized pieces. In a bowl, mix eggs and milk until light yellow color. Add sugar, cinnamon and vanilla and mix lightly. Place bread into egg mixture and stir until all the bread is covered. Place muffin liners into a muffin pan. Spoon bread into each of the muffin liners. Bake muffins at 350° for 12-15 minutes or until golden brown. Remove from oven and top with maple syrup.